I stood next to the engineering student from Hyderabad, when he pointed out the lady to me and expressed his admiration for her, yet all I could see was a river, the Ganges, which jumped, frolicked, whirled over the rocks in her path, or flowed around them in a gentle embrace. Ganga Ma, who is depicted as a young, beautiful woman with long, flowing hair on the posters for sale, remained hidden to my western conditioned mind. It however made me pensive how naturally the student, 21 years young and not a poet, invested the river with aliveness, which in the west is usually reserved for human beings and animals. Afterwards it almost seemed to me, as if “she” indeed not only jumped, frolicked, whirled and embraced, but also as if she enjoyed it, happy to be present, alive. We were standing in Gangotri at a height of 3140 metres near the Tibetan border. It is a popular travel destination, because the temple dedicated to Ganga Ma is located there. It is the place, where earlier, how much earlier nobody could tell me, Ganga Ma was born from the glacier. Over the centuries the glacier receded and is still receding. It is nowadays some 18 km to the east of Gangotri. 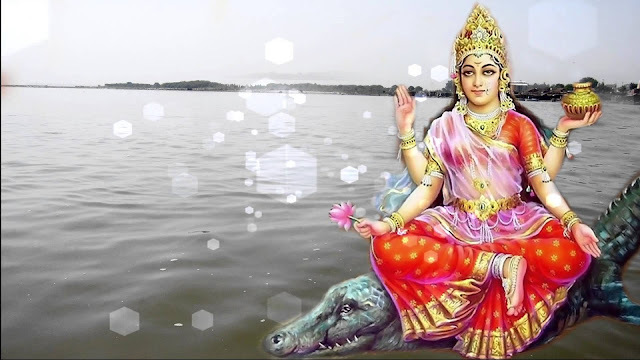 According to the mythology it was the Rishi Bhagirathi, who brought Ganga from heaven down to the earth thousands of years ago. 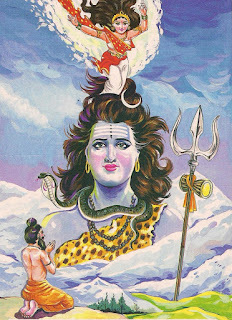 As the mighty impact of the fall would have been disastrous, Shiva caught her first in his hair. 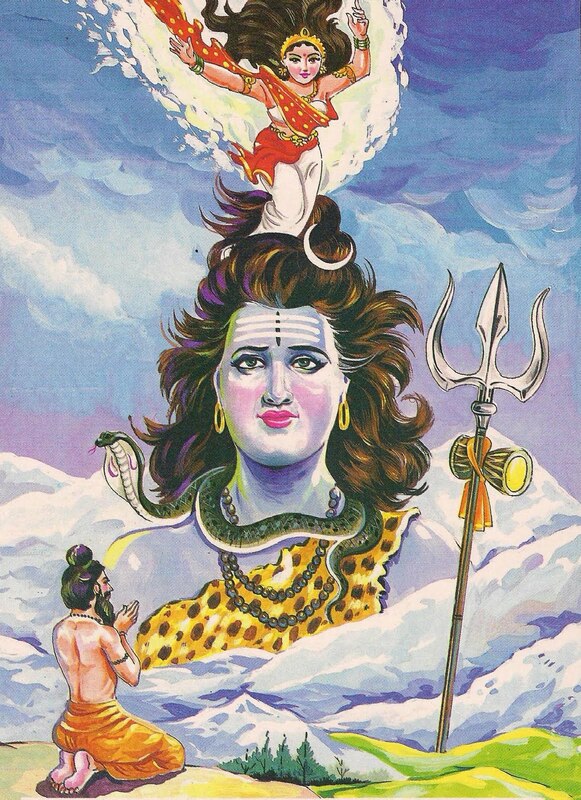 Whoever stands near the mouth of the glacier, called Gomukh, and witnesses with which immense power the newly born river surges out of the cave in the ice, will not be surprised that it needed Shiva to soften her fall. Many Indians dream to be up there at least once in a lifetime, in the stillness of the mountains, surrounded by snow-capped peaks which rise into the sky over 6000 metres high and to take a purifying bath in the young and lively Ganga Ma. 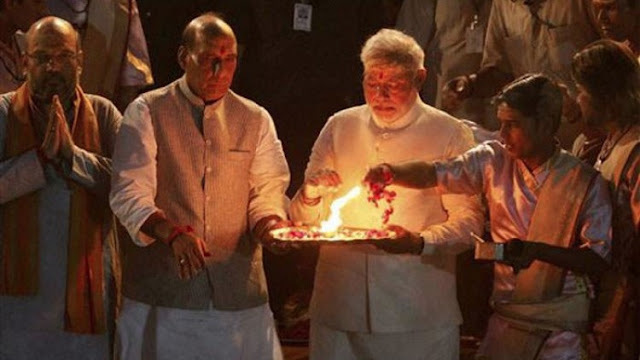 Young, modern Indians, too, come and have great reverence and trust in Ganga Ma. She symbolises the female, caring aspect of the universal power which governs all our lives. The pilgrims undergo a lot of hardship to reach there. The journey to the source of the Ganges leads through an impressive landscape, but is arduous and dangerous. The roads are narrow, winding and often full of potholes. Landslides keep interrupting the journey. Looking down into the deep gorge of the river can be frightening, yet equally frightening to me was the risky driving. Our share jeep kept audaciously overtaking in curves, and escaped a few times only narrowly a head on collision. Once, the driver had to make a sudden halt. My bag, which was on top of the jeep and obviously not properly secured, landed right in front of us on the road and luckily not in the gorge of the Ganges. The bus stand in Gangotri presented a colourful picture: old and young people from the plains poured out from busses and jeeps and slowly moved in their family clans from shop to shop towards the temple, on the way comparing the prices for the offerings. They were mostly poor without pullovers and in slippers, holding their children by the hand. Members of the middle class in contrast looked stout, well equipped with windcheaters, caps and sneakers, yet the elderly among them seemed to have little stamina. Especially corpulent women gasped for the thin air and took a break after every few steps. Then there were lanky sadhus with matted hair and ash smeared on their foreheads. They often were barefoot and wrapped only in thin cotton cloth. And there were tourists from abroad, on one hand young backpackers, who searched and found cheap places to stay, and on the other hand older, wealthy foreigners, who arrived by taxi and lodged in the most expensive hotel of the place. The ghat of the Ganges bustled with life. Small groups of people were sitting around pandas, doing poojas. Others bravely took a bath in the ice cold waters. Even some children were not spared. They tried hard, yet unsuccessfully to escape the grip of their parents and evade the mug that was poured down over their backs. Yet after the procedure they looked happy and definitely fresh. 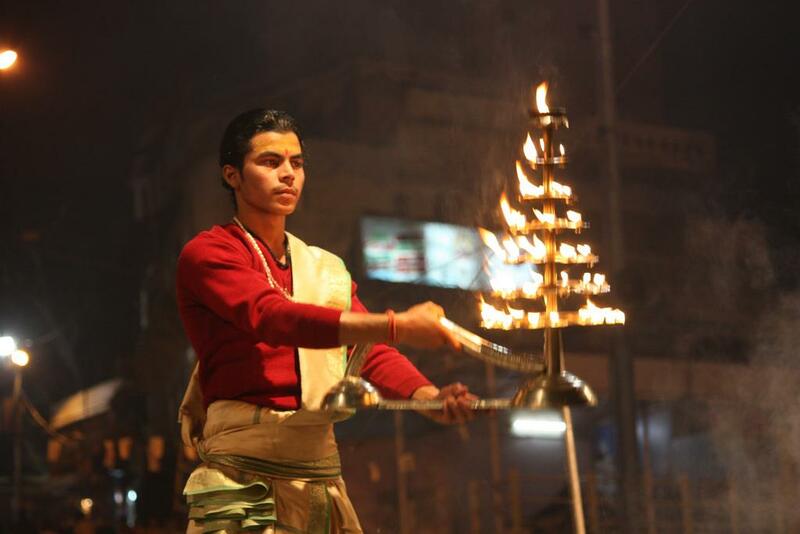 The evening Arti accompanied by drums was a wonderful experience. A big crowd had gathered in front of the brightly lit temple with high mountains standing guard and the dark, cool night surrounding it. The devotion of the pilgrims was palpable. It permeated the atmosphere and pulled everyone in, including one of the two soldiers who was on duty at the entrance of the temple. He handed over his gun to some lay person, who probably was a friend, took off his boots and joined the queue into the temple. After a while he reappeared, put on his boots and took back his gun. He had studied psychology in Varanasi. His parents were happy, when he presented them with his academic degree. They did not suspect that they would lose their son the next morning. His father was determined to get him married as soon as possible, now, after he had finished his studies, even though he knew that his son did not want to marry. As a teenager he had already declared that he wanted to become a sanyasi. Yet the father had gone ahead and had selected a bride. She was the only daughter of a wealthy friend. Early in the next morning the young man sneaked out of the house and never came back. “I had no other choice. My family lives in a very backward area. My father would have had to shoot me for not obeying him to save his honour,” he claimed. After finding a guru and taking sanyas, he called his home. His sister in law picked up the phone. He told her that he had renounced the world. She started to cry and he put the receiver down. Ever since, for seven years, he had not contacted his family. “They will miss you. Why don’t you at least call them”, I suggested. “Why should they miss me? My family consists of 19 members. Furthermore, Indian parents secretly are pleased at having a son who has dedicated his life to God, though they don’t admit it and even put obstacles in his way. He brings blessings for the whole family and they know it”, he argued. “India is a different world altogether”, a young woman from South Africa sighed after hearing his story. One day I started on my trek to Gomukh, the source of the Ganga. The sky was deep blue, the sun merciless and my nose thickly smeared with sunscreen. With a small backpack I first climbed many big steps right behind the temple, which steeply lead up to a path. From then on the trek was easy – a climb of only 800 metres over a distance of 18 kilometres. It was a wonderful feeling to walk in this grandiose landscape. The snow covered peaks were near and overpowering. There were few people trekking, not like the heavy stream of pilgrims who used to walk the last 14 kilometres to reach the temple in Kedarnath before the disaster struck in 2013, or the six kilometres to Yamunotri. As busses can drive right up to Gangotri, most pilgrims are content with doing pooja at the temple there. 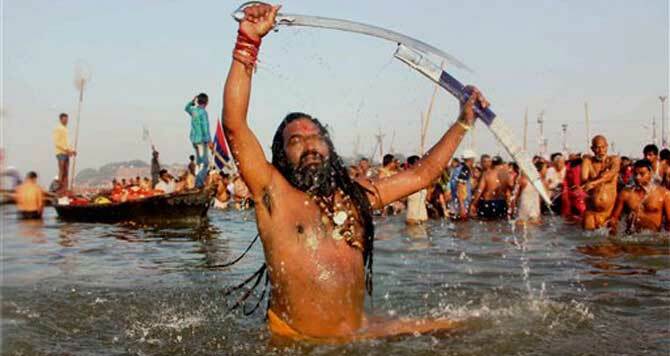 Yet the sadhus usually go to the source and some of those who are not tied down by a tight travel schedule. The local horsemen and even porters were walking fast. Most sadhus, however, moved slowly. Once, a sadhu came from the opposite direction. He had only one leg and supported himself with a stick. I was amazed and he noticed it. “Jay Ganga Ma!” he shouted the customary salutation with a big smile on his face. He obviously was in good spirits and joyfully and swiftly moved on with the help of the stick. For some time a boy was following me. He wore only a shirt and trousers, had no bag and probably not a single paisa. During the lunch break I talked to him. He was from Nepal, 11 years old and had come alone. He didn’t have any money. How do you want to manage without money?” I asked. The boy turned his palms upwards, shrank his shoulders and smiled. I offered him food and then asked him to move on. In the ashram of Lal Baba in Bojwasa, about 4 kilometres’ distance from Gomukh, I saw him again. It was already afternoon, cloudy and cold. He held tightly a hot tea cup with both hands, like everyone else. Whoever entered the ashram was straight away given hot tea, which was gratefully received especially by the thinly clad sadhus. Lal Baba, an old sadhu who exuded authority now questioned the boy and then sent him to the kitchen to help. On the next morning, after a sleepless night in a tiny, windowless cubby-hole, sleepless due to the smell from the toilet next door, I trekked the last 4 kilometres over rocky terrain to Gomukh, the mouth of the glacier. There I stood at the source of the river. What immense power, with which Ganga Ma starts her journey from the glacier. I sat down on a big rock and for a long time let myself be enveloped by the thunderous roar of Ganga Ma in the midst of silence. Suddenly the Nepali boy sprang up to where I was sitting. He had come with a group of sadhus and had spotted me. He looked full of joy, wearing an oversized pullover and holding two blocks of ice in his hands. “Photo, photo!” he demanded urgently. On my way back a German caught up with me. He was in his early thirties and except for the whiter skin indistinguishable from his Indian sadhu colleagues. His hair was matted, he wore several malas around his neck, was barefoot in flip-flops and fluent in Hindi. But when he switched to German, his dialect clearly gave him away as a native from Nuremberg, my own home district. He has been a sadhu since ten years, he told me. At first, he took drugs. But then an Indian sadhu advised him not to waste his life. He underwent a detox treatment and became the disciple of a guru, who earlier was an officer with the secret service “and even today does not trust anybody”. We trekked together till Gangotri, where he stayed in a small room by the Ganges. I went back to my hut in Yoga Niketan. It looked now comfortable and life in Gangotri almost city-like.